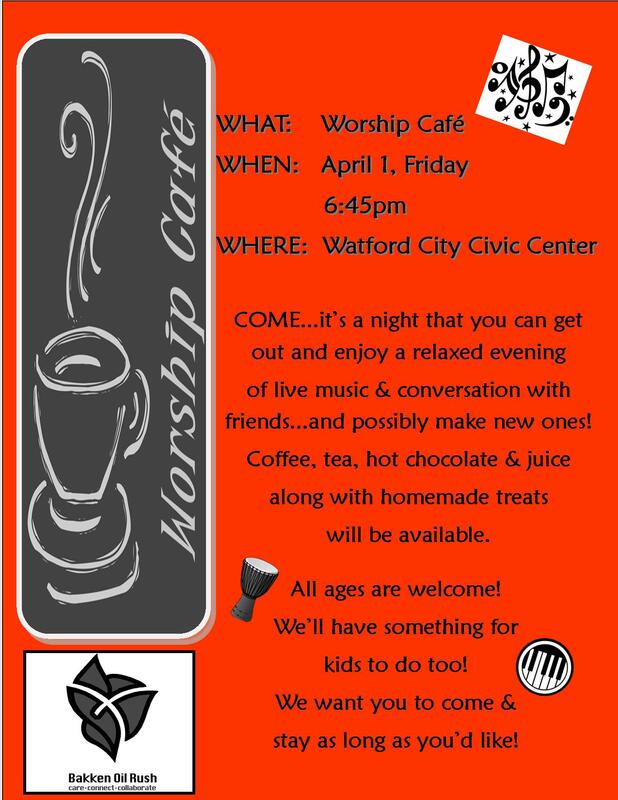 We would love to have you come Friday night and enjoy an evening of worship, visiting, 3 different kinds of coffee, tea and homemade goodies. It’s a laid back atmosphere where you can come…listen… and worship with us. Come and bring the kids…we have activities for them too! Come…stay as long as you wish…it’s one hour spent enjoying live music and fellowship. We’d love to meet and visit with you! Location: Watford City Civic Center. (across the street from the post office). This entry was posted in Our News. Bookmark the permalink. ← Today’s article in the McKenzie County Farmer tells our story!